Fixed issue with Plasma Flamer. Changed script naming schema to use mod prefix CW. Perform clean saves before updating. Previous version missing scripts. Flamer and Plasma Flamer VATS damage should now function properly. Please try them out. You guys will have to forgive me as I've been non-stop working on three different mods with over two dozen files to maintain and a lot of this is new to me compared to my work on Skyrim which didn't include any custom files of any kind and I never used or needed a FOMOD installer. The previous version was missing a necessary mesh and sounds. IMPORTANT NOTICE: PLEASE PERFORM A CLEAN SAVE BEFORE UPDATING TO v1.1. PLEASE READ CHANGE LOGS BEFORE UPDATING. If you have any requests to have an under-performing weapon looked at, please leave a comment so I can look into it. Greetings and well met fellow Vault Dwellers! Here I will explain all the changes and additions that will hopefully prove useful to you. In summary, there have been a lot of changes to the way the Flamer, Minigun, and Plasma Thrower work, as well as a few other relatively minor tweaks which I will cover in greater detail below. New receiver mod for the Double-Barrel Shotgun to give it some late game punch! New ammunition to go with the new Double-Barrel mod. Flamer damage has been tweaked to stand toe-to-toe with the best of'm! Plasma Thrower (and Plasma Guns in general) have been slightly tweaked. Minigun has three new barrel mods. Adjusted sounds for Minigun and Gatling Laser that are based on fire rate. Place "Cyan's Weapon Mod.esp" and "Cyan's Weapon Mod - Main.ba2" into your Data folder. DOES NOT REQUIRE ANY COMBINATION OF DLC. Place all compatibility patches at the end of your load order! FLAMER, PLASMA THROWER, VATS AND YOU! Now it's time to talk about VATS. Specifically as it relates to the Flamer and Flamer barrel upgrade on the Plasma Gun. As we all should know by now, flame weapons are more than terrible in VATS, they do absolutely nothing. They also have a tendency to bug out after exiting VATS, further extending their uncanny ability to deal no damage. Well.. I'm here to tell you that I have at least solved one of these problems. Both the Flamer and Flamer barrel now deal excellent damage in VATS that scales with all player perks, however this does not include bonuses from perk magazines as it's entirely too complicated to incorporate those perks without using a script, which I didn't want to do. You can at least rest assured that perks you actually invest in are going to provide you their full benefit. - If you plan to use a critical, save it for the first attack in any queue. It will deal the most damage. - If you plan to use multiple criticals in rapid succession, wait until you exit VATS after the first critical to re-enter VATS and execute the second. Rinse and repeat. - When attempting to build critical charge, make sure to always queue at least two attacks. If you only have enough AP for one attack, just wait until you get enough to execute a second at the very least to gain maximum charge per AP. There's still a few bugs where damage doesn't always deal as much as it should though this isn't too common and it's nothing like it was previously. Lastly there's still the tendency for the weapon to stop dealing damage for a short time after exiting VATS but this isn't extremely common either, at least it wasn't during my play testing. NEW 20mm Grenade Receiver - Changes ammo type to 20mm Grenades. NEW 20mm Cluster Grenade Receiver - Changes ammo type to 20mm Cluster Grenades. - Both require Gun Nut 3 and Demolition Expert 1. - New custom sound for the receivers to give it that authentic feel. NEW 20mm Grenade - Deals 50 base explosive damage. Weight 0.2. - 20mm Grenades require 5 Flares, 1 Shotgun Shell, and 1 Fragmentation Grenade to craft. Produces 5 grenades. NEW 20mm Cluster Grenade - Deals 10 base explosive damage on impact then fragments into 15 pieces that are projected upward and deal 20 base explosive damage on impact. Weight 0.2. - 20mm Cluster Grenades require 5 Flares, 1 Shotgun Shell, and 1 Fragmentation Mine to craft. Produces 5 grenades. - Both can be crafted at a Chemistry Station, and require Gun Nut 3 and Demolition Expert 1. - Base damage increased to 15. 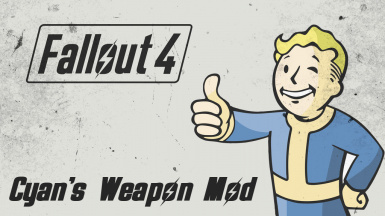 - Charge Rate reduced to compensate for the way this weapon interacts with VATS. Compression Nozzle - "Better damage, rate of fire, and critical shot damage. Reduced range"
Vaporization Nozzle - "Superior damage, rate of fire, and critical shot damage. Inferior range"
- Requires Gun Nut 4. Long Barrel - "Increased reach. Inferior rate of fire"
- Fire Rate - -33%, or 60/70/90 depending on what nozzle you have equipped. - Requires Gun Nut 2. - Note: If you decide to use this mod, be sure to install it after a nozzle, otherwise it will be overridden by the nozzle's range. This is not my doing, just something I noticed when testing. Napalm Tank - "Some men just want to watch the world burn. Superior burning damage"
- Removes the base enchant from the weapon and attaches a new one. - Base enchant deals 3 damage per second for 3 seconds for a total of 9 damage, is affected by energy resist, and does not stack. - New enchant deals 1 damage per second for 6 seconds for a total of 6, is unaffected by energy resist, and stacks. - Requires Gun Nut 3. - This damage scales extremely well with the rate of fire bonuses on upgraded nozzles. As such, to attain the highest DPS possible use the Standard Barrel. If ammo efficiency is a concern consider the Long Barrel. For double the fun, consider a Wounding Flamer. NEW Advanced Barrel - "Improved damage, accuracy, and range"
- Values are compared against the standard barrel. Accelerated Barrel - "Improved damage. Superior rate of fire. Inferior range and accuracy"
NEW Armor Piercing Accelerated Barrel - "Improved damage. Superior rate of fire and armor penetration. Reduced range and accuracy"
- Values are compared against the accelerated barrel. - Both accelerated barrels now play a tweaked sound that is more in line with the rate of fire increase. Tri Barrel - "Inferior rate of fire. Better damage, range, accuracy, and recoil"
NEW Armor Piercing Tri Barrel - "Inferior rate of fire. Superior damage, range, accuracy, recoil, and armor penetration. - Values are compared against the tri barrel. - Both tri barrels now play a unique sound that is more in line with the rate of fire decrease and barrel design. - Base damage reduced from 24 to 12. - Base damage on all barrels except the Flamer barrel increased to compensate. - Flamer barrel now scales with Commando perks instead of Rifleman - the weapon gains the boolean variable for automatic but not the keyword; clearly an oversight by Bethesda. - Flamer barrel charge rate reduced to compensate for the way this weapon interacts with VATS. These changes were made for two reasons; the weapon itself benefits more than any other weapon with certain barrel mods due to the way damage bonuses are calculated and the fact that this weapon has two different sources of damage (energy and ballistic), and for that reason it made damage bonus scaling with the Flamer barrel completely over the top relative to other weapons in terms of scaling. Weapon damage bonuses scale off of the base damage of the weapon. For example if you take a Combat Rifle and upgrade it from base (33) to the Hardened Barrel which increases damage by 25% you end up with 41 damage as you might expect. However, due to the nature of the Plasma Gun dealing damage from two different sources simultaneously, as well as having two sources of damage bonuses, the weapon effectively double dips, which is fine under normal circumstances except when you lower the damage below base as is the case with some of the barrel mods. This is why the Plasma Gun is so strong relative to most other weapons of its class. To be more clear, let's examine the thing that led me to this discovery; the Flamer barrel. In the base game if you attach a Flamer barrel the damage is reduced to 12/12 from 24/24. However, the damage scaling remains the same, which means that this weapon no longer gains 25% bonus damage but rather 50%. A Plasma Thrower with a Boosted Capacitor (25% bonus to damage) increases the damage of the weapon from 12/12 to 18/18 rather than 15/15 which would be more appropriate for an automatic weapon. This is the result of the weapon having a relatively high base damage and two different sources (barrel and receiver) for damage scaling as opposed to the usual receiver upgrade, and having one of those sources cut the damage in half. A fully upgraded Plasma Gun with the Flamer barrel on my Commando with Lone Wanderer 3 and Bloody Mess 1 saw a damage of 78/78 on this weapon, which is absolutely absurd relative to other automatics, not to mention its closest counterpart, the Flamer. As was stated earlier, the base damage on other barrels has been increased so that they have the same damage that they would have otherwise. They now gain +6 total damage per capacitor upgrade instead of the usual +12. This leaves the other barrels largely unaffected overall as they are still excellent value that rivals anything else in its class. A fully upgraded Plasma Gun with the Improved Sniper barrel, 5/5 Rifleman, 3/4 Lone Wanderer, 3/4 Bloody Mess deals 292 total damage after these changes. Prior to the changes the same weapon would have dealt 344 total damage with the same perks, a net loss of 52 total damage. However let's compare that to the Hunting Rifle. Under the same circumstances with the best upgrades the Hunting Rifle churns out 184 damage per shot, which is still miles behind even a nerfed Plasma Gun, and that's not even factoring rate of fire. Through my testing it felt largely the same in terms of overall effectiveness. I'm sure you'll feel the same once you put it to work. Gatling Lasers with the Rapid legendary mod now have a tweaked sound that is more in line with the rate of fire increase. Since the Rapid mod cannot spawn on Gatling Lasers this applies specifically to the Final Judgement unique weapon. The weight of Missiles and Mini Nukes has been reduced from 7 to 5, and 12 to 8 respectively. Damage bonuses from Demolition Expert no longer affect the Minigun. With the changes I've made to the weapon itself, you'll see why.